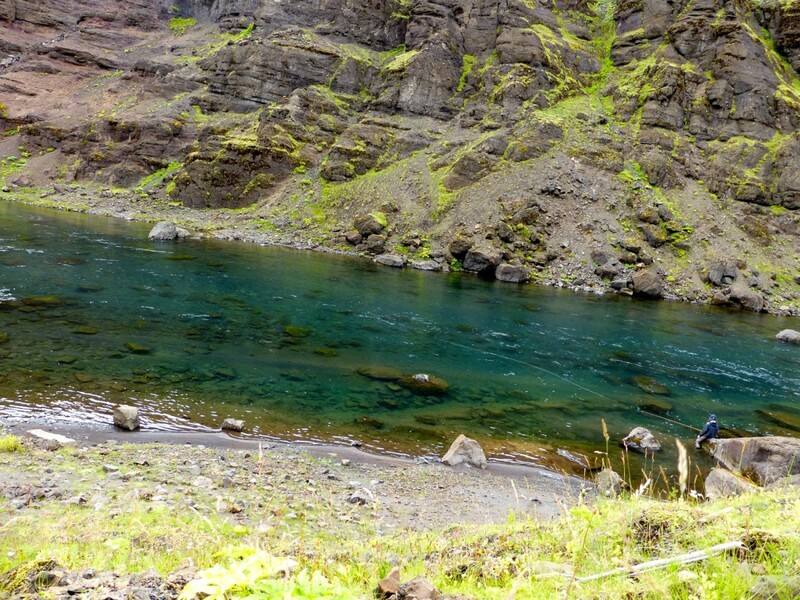 My father had for a long time told me about this river many years ago, The Stora Laxa. I must admit I was fond of his stories of the view there and breathtaking photos but something kept me back. Weather it was that I was busy having a great time at another river catching masses or my hidden inconfidence thinking I could not fish this challenging river. 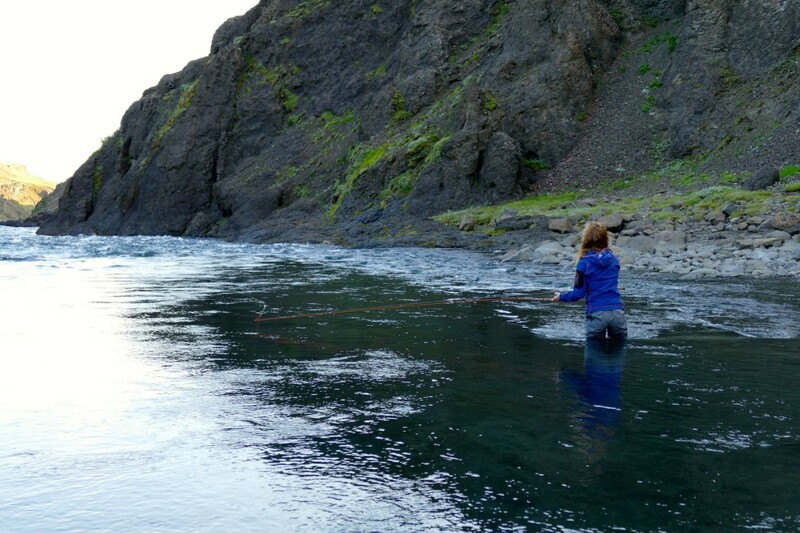 I was used to heavy tackle, sinking tips and not so delicate fishing as the Stora Laxa required, it is the heaven for floating lines and the riffling hitch. My father used to call me, dead tired and tell me he worked hard all day and finally caught this strong big salmon, I used to think; “why is he doing this, he is making it harder then it has to be”… well the salmon is big but non the less he worked all day for it and caught one while I maybe was catching 10 at another river with higher catch statistics. The happiness in his voice couldn’t have been hidden and it got my curiosity rising higher then any other emotion. 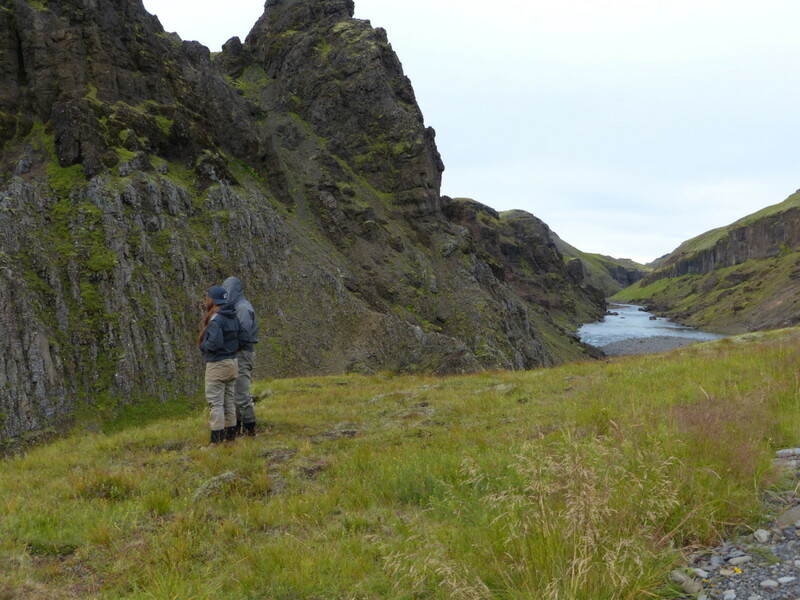 I stepped on the gasoline and speeded my way through the ever beautiful Icelandic countryside. Playing Eric Clapton tracks with a little smirk on my face surprised how my, at the time, little baby Toyota Corolla could take all my countryside driving, I drove it as I was on a monster 4×4, which the car was certainly not! … it stood by my side non the less, much like our family lab. I was there. I could feel it immediately, there was something about this river. I could feel the hair rise on my skin and I decided this river was a challenge I was ready for and gladly accepted. I thrive on a challenge and that was exactly what I needed. 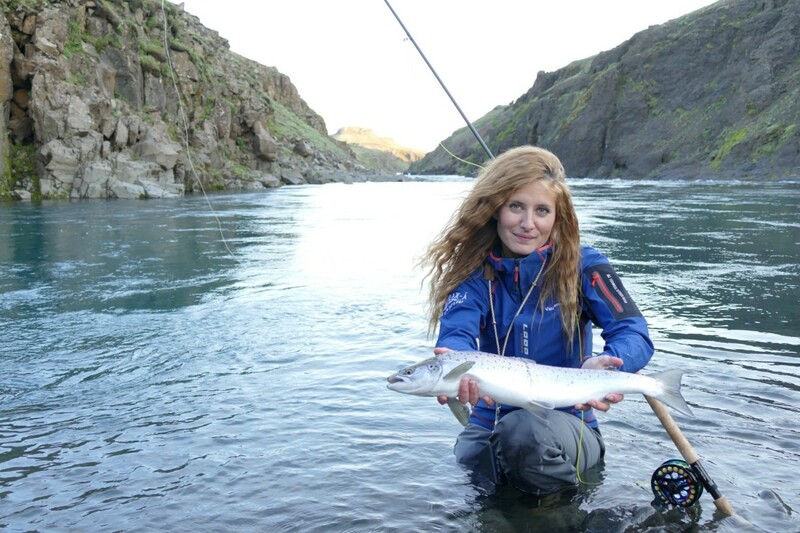 It´s gin clear water, breathtaking canyons that make even the biggest person feel small, the green lowlands meeting your eye with nothing but pure nature and fresh air and best of all, the monster strong salmon hiding down under. This place had me at awe. This is a place that was made for the floating line and the riffling hitch! And each mistake you make is costly but every success rewarded. At the time I was much more used to fishing with heavier tackle, sinking line and heavy tubes. This was completely different, I realized at first cast in this beautiful pool called Laxarholt on Stora Laxa. Standing opposite this big terrace and about to cast near the hotspot I knew I should be careful. Took a few steps back and took a few casts, making even myself blush I knew this was not about to work, the water splashed to much. Every cast needed to be good and careful, the calmness there was not to be disturbed and neither were the salmon, not unless of course I was fighting it! It took me a while to figure the river out, challenging myself every single day and I could feel how much better of an angler I was coming, that was what the river requested, either improve and that fast or leave it alone. I was hooked and wanted more and set out to explore the river and its magic. As I was staying at their house and my father told me he was going to wake up early and drive to the Stora Laxa (1 hour drive) and fish early at 7 in the morning. He woke up early and was a bit surprised seeing my car missing from the driveway. Not giving it more thought he drove up the river with his rods desperately waiting to be used on his car. Only to be driving up there and over the bridge just before reaching one of the best pools to see an angler there. “A POACHER!!! !… ON MY RIVER, WHEN IM GOING FISHING! ?”, I imagine his face changing colors between white, red and everything there between caused by the shock. He rolled down the window and screamed a few words out there only to see the angler turn around and realizing it was his own daughter poaching his beat before he could reach it. We laughed about it and still do and don’t cut each other any slack and have endless memories of helping and cheating each other when it comes to fishing but most of all love to share the passion and our never ending interest for fly fishing and the never ending challenge. I said some things in english while fighting this powerful fish who at the same time was taking my fly down to the deep and slowly but very surely. I knew this was my biggest one so far at the river and I MUST land it and hold it…. at the same time I must act cool for the camera while all I wanted was to jump and act all stressed. I talked to the camera in english explaining what was going on, looking all like “I got this”, but when the camera was off I was talking with Brynjar in Icelandic (very not understandable language) , panicking of excitement saying: “I CANT LOOSE IT I CANT LOOSE IT, MY GOD I MUST HAVE IT”…. once the camera was on it was just: “Yes, Im slowely and calmly reeling it in and we will see this monster salmon any moment now”. Surely though after panick on the inside I had that beautiful salmon in my hands. I will never forget the thrilling adrealine kick and that is what keeps me going, I want and need that feeling again. I love the feeling of having a fish on, it gets me like nothing else and I am overtaken my happyness, excitement, panick and overall enjoyment. 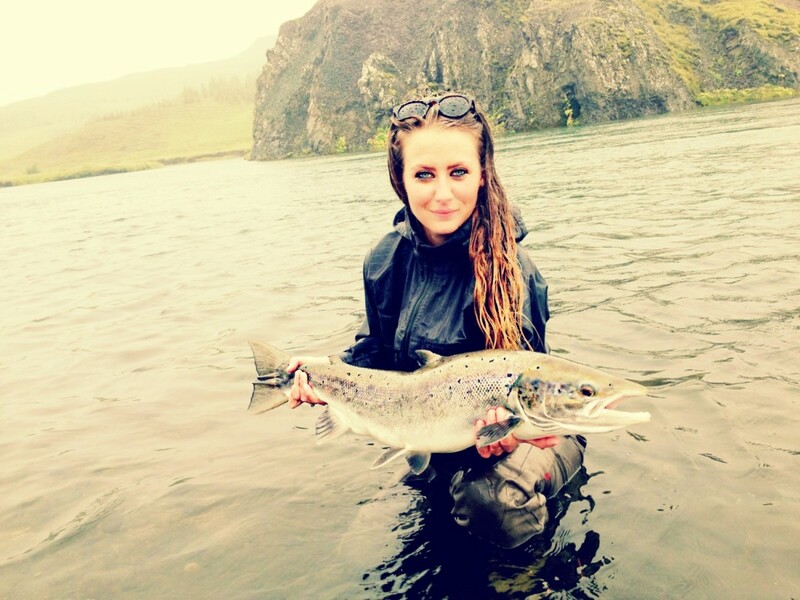 I hope you had a good season this summer if you were in Iceland as it was a great one! And remember to tune in to great new BBC 2 series: Earth Wildest Waters: the Big Fish, airing on Sunday at 8pm. Im thrilled having more fishing on TV !